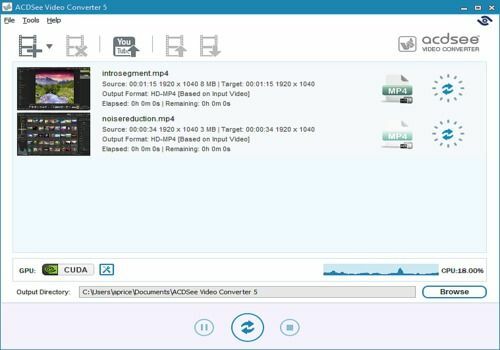 ACDSee offers the standard version of its video conversion software. Video Converter 5 is an easy-to-use software that supports a large number of video formats. In total, more than 100 formats are supported as input. Among the latter are the MKV, MP4 and AVI. With its batch processing functionality, ACDSee Video Converter allows you to convert multiple videos simultaneously by specifying a particular format for each of them. Note also that the user has many customizable conversion profiles. Thus, it can easily modify the audio or video bitrate and resolution. Video Studio supports formats that are compatible with most devices on the market. This allows you to convert videos to the format played by your console, smartphone or tablet. WonderFox DVD Ripper Lite is the right and free solution that is easy to use to rip DVD content to a wide range of consumer video and audio formats. A complete solution for extracting, burning and converting videos compatible with the most popular formats. Freemake Video Converter converts videos between 500 formats and gadgets. Convert to MP4, MP3, AVI, MKV, WMV, DVD, iPhone, Android, PSP. Convert clips on YouTube, Dailymotion, Vimeo, Facebook. 100% free, efficient and in French! M2TS Converter, M2TS AVI Converter, a converter software to convert M2TS to AVI, M2TS to MKV, M2TS to MP4 and supports free download.